I am typically not the type of person to wear dresses or skirts unless, say, I am going to church or a wedding reception. In fact, when I was growing up, getting dressed up was almost like a chore, I truly despised it. Every week when my family returned home from church I would race into my room and immediately throw on a pair of pants or shorts. Now that I'm older and have matured just a little bit, I am realizing that skirts are not so bad. Plus, if its anything above 85 degrees outside (which it is well over that ever single day here in NM) a nice airy skirt is a great way to "beat the heat." 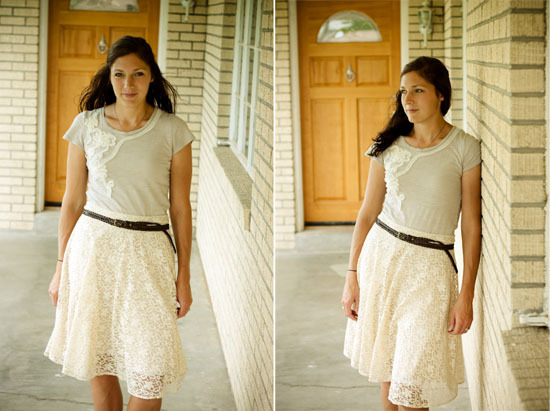 I found this lovely cream lace skirt at a boutique in Colorado on our little family trip, 4th of July weekend. I normally only window shop at boutiques (because I can't fathom the price tags) but this one happened to be on sale for $25...not to bad especially considering I have already worn it about 10 times! Here I am proving you can do just about anything in a skirt...even ride the Alpine Slides! Do you have a favorite summer skirt or something you typically wear to keep cool? I'm loving this skirt! Skirts really are the best for summer and keeping cool. Want that skirt, BAD! I've been loving skirts for several summers. Can't beat it to keep cool. love that skirt! and I have ALWAYS wanted to try those slides, ever since i was tiny and they showed them on the opening sequence of sesame street LOL!! Beautiful skirt! I want one!! The Alpine Slide looks like great fun! Love that skirt! Dresses and skirts are my best friend during the heat! Beautiful skirt! My go to is normally my easy to get on jersey dress. Its comfy and easy to dress up or down! I wish i had it in every color! Thank you for your sweet comment on my guest post! Regarding the watermelon cookies on a stick(I don't see your email)...I roll them a bit thicker to accomodate the stick which seems to help it hold better. I'm the exact same way...skirts are growing on me the older I get! Yours is adorable, perfect for the summer! You look so beautiful!! What a pretty skirt. It fits you perfectly. Minuture golf is so much fun..and you little guy is just so cute. I am with Stephanie...love the Maxi dress!